Great art meets great wine in this popular series! Sample a variety of wines, all tied to a specific museum theme. Great art meets great wine in this popular series. Sample a variety of wines, all tied to a specific museum theme. Bottles of wine may also be purchased the night of each tasting. Date: Thursday, February 14, 6:30 - 9:00 p.m.
Vine & Canvas returns in 2019 with a special Valentine's Day event on Febuary 14 - 100 Years of Love! 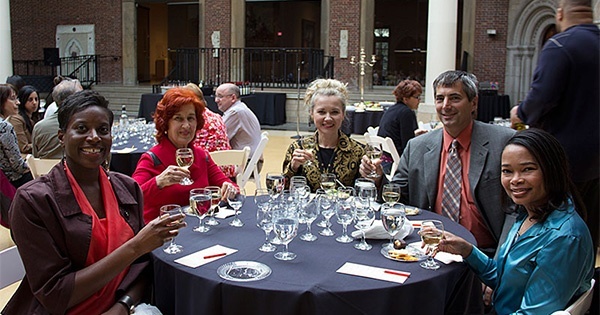 Join us in celebrating 100 years of love, service and partnership the museum has provided to the community with a Valentine’s Day wine and chocolate tasting. Steve Slinger, Regional Manager for Trinchero Family Estates will be presenting along with a sampling of fine chocolates and a guided museum experience focusing on the museum’s centennial. Bottles of wine may also be purchased the night of each tasting. Vine & Canvas wine tastings often sell out - advance ticket purchase is recommended! All tastings take place in the museum's Shaw Gothic Cloister, beginning at 6:30 p.m.
Find more events like "Vine & Canvas at the DAI"